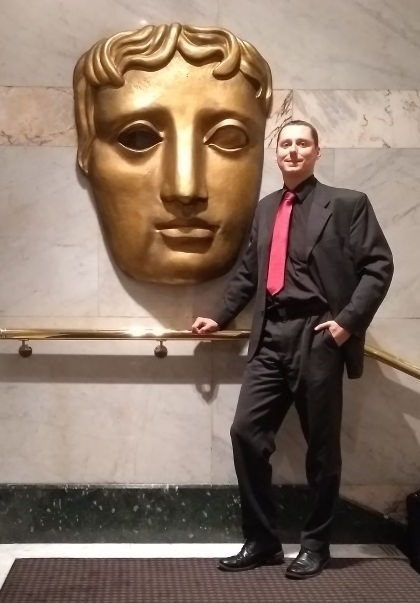 Since it’s their results week too as we publish this, here’s a pic of Ian Kennedy, our Director of Worldwide Development, at BAFTA for a recent meeting with our founder Alex Ross! Steven explained that PEAKY BLINDERS is based on stories of his parents and uncles, many of which he heard while around his blacksmith father while he was young. Once the BBC took an interest, things moved quickly. With series 1 complete, Steven was looking at potentially making 4 or 5 series of PEAKY BLINDERS. PEAKY BLINDERS uses some CGI, but mostly uses derelict locations that aren’t about to be knocked down (one key location is the street where Ringo Starr was born!). There was resistance to setting PEAKY BLINDERS in Birmingham (UK) because of the unglamorous accent, but Knight insisted on retaining that authenticity – he believed that we should be telling our own stories of places like Birmingham. The basic premise of LOCKE (starring Tom Hardy) was a journey from Birmingham to London, where someone starts out with everything and ends up with nothing – exploring how that could happen. If the cost is low enough, you can get creative freedom to run a project your way. LOCKE knocked CAPTAIN AMERICA off number 1 in terms of revenue per screen! It was on vastly less screens of course, but that was still very promising. Knight was determined that the character in that film should be the most ordinary person possible. He explained that you have to write a three page outline for studios, however unlikely the script was to end up that way. Knight prefers not knowing where a story is gonna go. He writes, then goes back to the start every day and works through from there. Knight has accidentally become the poster-boy for Birmingham’s drives to move to the next level in its drive to become a major player in global culture. He intends to build a major sound stage in Birmingham as London’s major studios are fully booked, with a ‘halo effect’ of businesses based around it, and from this to also create a scene where live theatre can lead to movies being made. Ian Kennedy’s conversation with Steven Knight turned out lots of interesting information about the inner working of the industry. If you haven’t read it yet, why not take a look at Part One by clicking here? Steven Knight says that we’re entering a golden age of TV and film. He explained that the US system is great for writers – it’s unionized and you can make a proper living just from writing. He actually felt that there seems to be a good mystery to you if you DON’T live in LA, as long as you’re prepared to fly out every 6 weeks and do late-night conference calls. But he explained that the Hollywood system is slow! It takes many years of gestation most of the time. If you persuade a star to be in your project, the studios know they’ll make back a certain many million dollars from it – his film HUMMINGBIRD (with Jason Statham) was in profit before it even got to the cinema. He felt that distributors often underestimate their audience and focus on young males. Screens are better nowadays so TV drama has risen a lot. 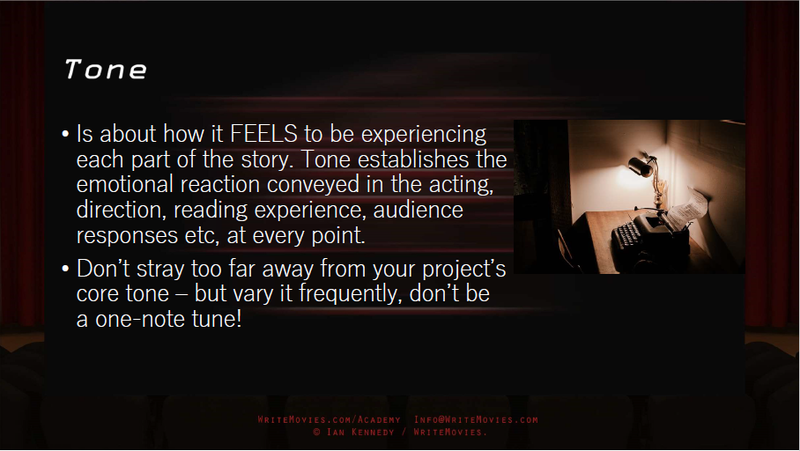 Actors like TV and it’s a writer’s medium – writers have control there, unlike other formats. Too many people are involved in making films, telling you something’s not good enough in order to justify their presence and pay. But getting actors to commit beyond series 1 of your TV series is hard because they may get film offers. Show runners write episode 1 in the US and their team of writers – who’ve developed it with them – do other episodes. Writers rise up through the ranks in the US. British TV writing is more eccentric and individualistic – the US system is more corporate. Theatre writers are good for TV due to their ability with dialogue and are often overlooked. Steven Knight explained that he had begun his career in the UK by writing plenty for radio, and for comedians including particularly Jasper Carrott, and writing 31 episodes of Carrott’s sitcom with Robert Powell, THE DETECTIVES. Steven was one of the 3 founders of WHO WANTS TO BE A MILLIONAIRE. He also wrote novels for Penguin, and presented DIRTY PRETTY THINGS to the BBC which led to that commission. Then came AMAZING GRACE, for the 200th anniversary of the end of the slave trade, and EASTERN PROMISES which led from DIRTY PRETTY THINGS. The award nominations that came as a result of these put him into the US system, which he found to be great for writers. He got to direct HUMMINGBIRD which he had also written, and after that wanted to get total control of a project – and he feels that LOCKE vindicated him becoming a director. 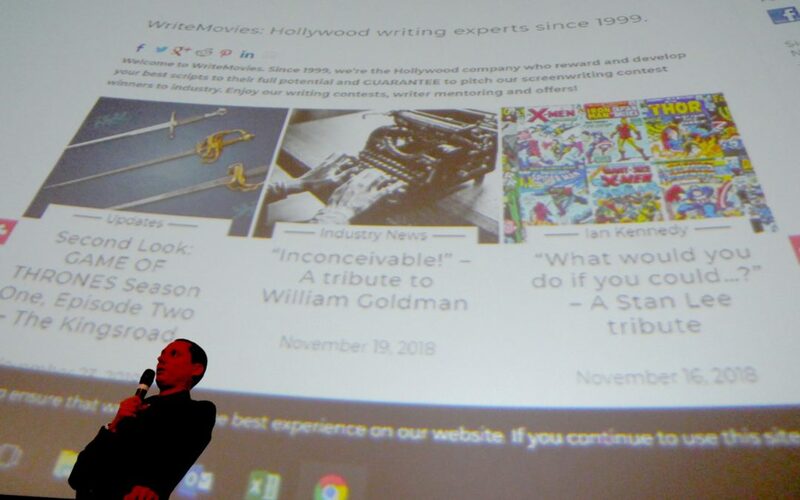 A Hollywood Pitching Whirlwind Tour, part two – make it your script next! A Script Pitching Whirlwind Tour in Hollywood – and yours could be next! 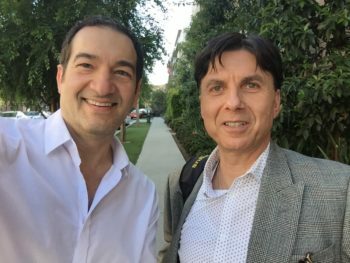 WriteMovies founder and producer Alex Ross and VFX expert turned movie director, Habib Zargarpour, just went on a tour of various Hollywood production companies talking to top executives about their new project. Here’s what happened! Alex and Habib started with an early morning meeting during which Habib gave a full presentation on the script they were pitching. The lawyer was very impressed. Among other things she suggested who to get in touch with for funding. Alex gave the attorney a follow up call and there is definite interest on working on this project, and potentially other suitable scripts. Another great meeting during which the producer showed interest in the project. She and her team totally got the value that Habib would add, to deliver a studio grade, VFX based picture for a fraction of the usual price. Many of the smaller production houses want to get involved in higher end VFX based projects but cannot afford the costs. This is what is so interesting about Habib’s work, in that he and his team at Digital Monarch Media have devised a software/hardware package, which has been tested by some of the greats such as Spielberg, Jon Favreau, and Denis Villeneuve, which allows producers to deliver studio grade VFX for a faction of the price. 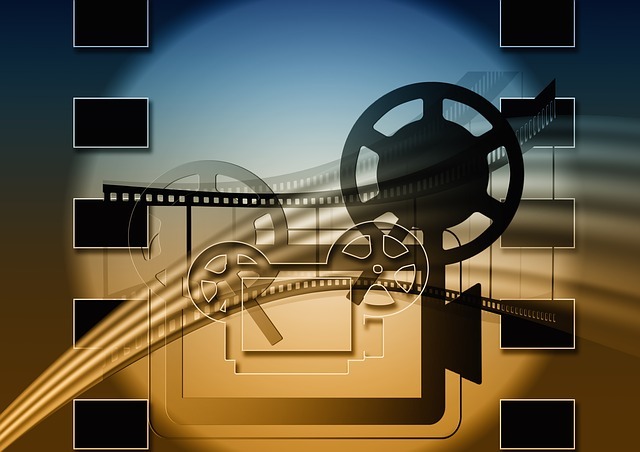 Their latest Virtual Film Toolset is called Expozure and was used on Blade Runner 2049 and Tom Hanks’ Greyhound. There was a request for more info on budget so the team have a better idea on how and where to take the project –with the packaging suggestions we had in the first meeting, there’s some good signs and avenues for us to explore. After a full demonstration by Habib, the producers expressed interest in the project and explored Habib directing another of their projects as well. An interesting meeting with the top brass. They already really like the script. Totally got what Habib can bring to the table as a director. Needs us to come up with a formal proposal. “See you on the red carpet”. Alex and Habib finished their day by meeting with Julio Sobral, former senior Fox Studios executive and now top of the food chain at BAM. Julio has a very deep background in post-production and FX and also really liked the fact that Habib was a partner at Microsoft Studios and helped to design a number of games which generated more revenue than a lot of blockbuster movies. So the ability to fully map out the ancillary revenue streams for your project are key to production companies and something you need to work out before you go to pitch. BAM is part of a substantial chain of media companies, so Julio wanted us to come in and pitch not only with a view to getting Habib and Alex’s film done but also to consider working on some of their other projects. Could we PRODUCE your VFX-driven script? Enter now! We’re looking for a script for a two-time Academy nominee and two-time BAFTA award-winning director – and submitting your VFX-driven script to our Spring contest can make it yours! 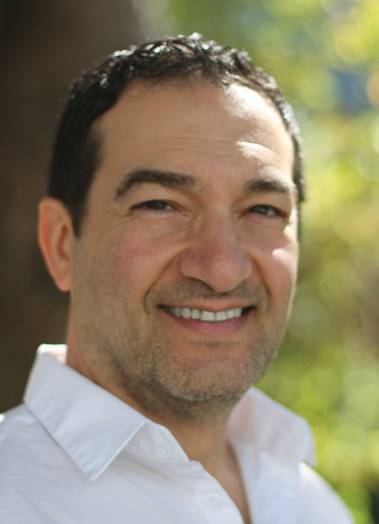 Habib Zargarpour has worked with Spielberg, Lucas, Cameron and Villeneuve, on movies that countless millions of people have seen – and soon your script could join them. We’re looking for a great commercial script for him to work with, and if you submit to our Spring 2018 contest, you will be in the running for that opportunity. 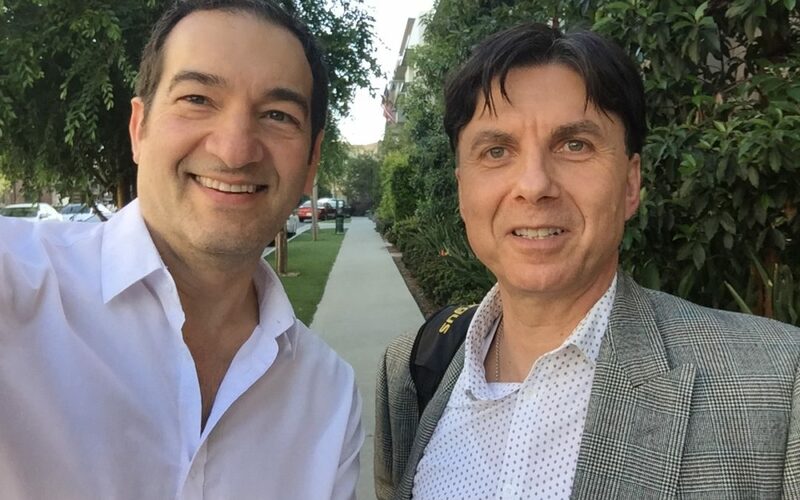 As we’ll tell you very soon, Habib and our founder Alex have been getting a lot of success in recent meetings with senior Hollywood execs about their next crossover project, and yours could be next! We’ve introduced many new categories to the Spring 2018 – long and short form TV pilots, indie and studio scripts, and video game scripts. Inspired by this opportunity, we will be giving a special recognition to the Best VFX Driven Script that we receive. There’s no special prize – just kudos – but if Habib loves it then we CAN make this happen. What we want is the script where VFX can help drive the plot, the characters, and the script as a whole. We don’t want style over substance, we want style to give substance! We’re looking for a VFX-driven script with crossover potential to make an awesome video game. The director of this project, Habib Zargarpour (find out more about him in THESE past interviews, and in more articles we’ll publish soon!) has been VFX consultant on lots of major movies and major video games including 007 and NEED FOR SPEED titles – so we have the potential to take this to both markets, which is exactly what Habib and Alex have been doing for another project in Hollywood in the last few days – as we’ll be telling you next week! So polish up that movie script you thought would be too expensive for anyone to make, and get it to us NOW!